The recent entries is a great way to see what information has been entered recently by your athlete's and by other professionals. It shows and displays the most recent information entered. If you are interested in a specific type of event, simply select to view on a specific form using the "Recent Entries" drop down box. Click on the "recent entries" Tab to be shown the recent data activity for the athletes who you have access to . The most recent entries across all of the data you collect will be shown. Scroll down the page to see information. All of the recent entries will be shown by date, and you can select on the blue "Form Name Link" to be take to see/edit the actual entry. 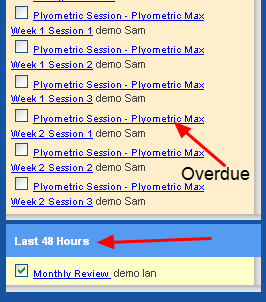 You can view the recent history for a specific event by click on the "Recent Entries" Drop Down box and selecting a specific Event. All of the recent information entered for that event will be displayed down the page. On the right of the recent entries page any events which have been entered within the last 48 hours will be available to review. Any events that have been entered as drafts and have NOT been entered as saved and closed will also appear on the right of the recent entries page. The image here shows that there is data which should have been entered, but it is now overdue. You can click on a blue link to be taken to that entry to enter in the information.